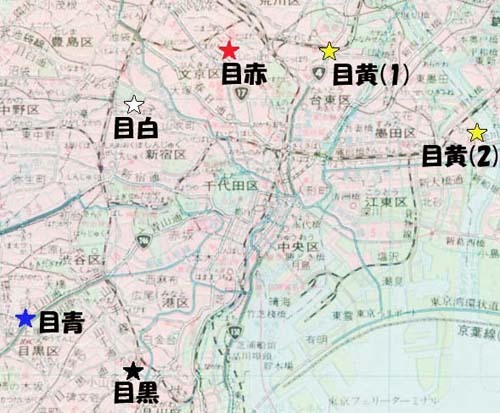 Five temples stand guard at strategic stations around the city of Tokyo, each at different points on a pentagram. Inside these five temples are five statues of the god Fudo; each statue has eyes of a different color, completing a magical circle of protection that guards the city from harm and ensures its prosperity. This mystical circuit is called the Goshiki Fudo—the Five Fudo Temples—and still protects Tokyo to this day. What Does Goshiki Fudo Mean? The kanji for Goshiki Fudo (五色不動) is simple—it translates as Five-Colored Fudo. The number five itself is significant. It comes from Buddhist traditions, where sequences of five are considered sacred, such as the Five Buddhas (五佛; gobutsu) or the Five Wisdoms (五知; gochi). These in turn are based on the idea of the Five Senses (五識; goshiki) and the theory of the Five Elements (五行; gogyō). The five colors (五色; goshiki) are associated with the five elements and the five directions. There are different combinations of colors depending on what sect of Buddhism you belong to (and maybe even a secret sixth color if you are a mystical type). These five colors were used for all sorts of magical items, such as the Five-Colored Cords (五色の糸; goshiki no ito) used for rituals in the Heian period, or the Five-Colored Water (五色水; goshiki sui) ceremony held in some temples to commemorate the historical Buddha’s birthday. There are more examples, but the gist is this—put those five colors together and you are talking some serious magic. For the remaining kanji, you have the god Fudo (不動), whose name translates literally as “unmovable.” He is a particularly cool god. 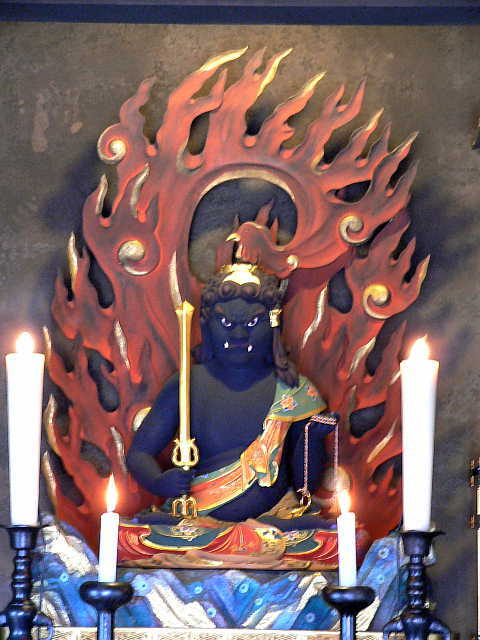 Fudo looks like an oni with his fierce visage, proudly upheld sword, and flaming throne. There’s really too much to be said about Fudo to go into it here, but suffice it to say if you were going to pick a god to defend your city in a magical circle of protection, Fudo is a good god to gamble on. According to legend, in the early 17th century the new shogun Tokugawa Ieyasu asked the abbot Tenkai to establish a mystical circle of protection for Edo, the new capital of Japan. To complete his task, Tenkai drew a symbol of the onmyōji—a 5-pointed star—around the city. He consecrated each point of the star with a temple. Inside each temple was a statue the god of Fudo, each with a different eye color. The statues combined to bind the power of the five sacred colors and provide the desired mystical protection. The facts are far less fun. The Goshiki Fudo does not exist. If you look at a map, the designated the temples don’t make a pentagram, except in the most imaginative sense. There aren’t even five temples. And on top of that all the Goshiki Fudo temples are conveniently located along the central Yamanote train line that circles Tokyo. Meguro Train Station from this site. That’s right; the legend is a tourist trap, with little historical basis. The oldest known mentions of the Goshiki Fudo comes from the Meiji period. Apparently there is some connection to a mystery novel that was popular at the time. The story used the idea of the five-temple circle of protection as a plot device. The details are tenuous and I wasn’t able to track down the actual name of the novel, but most sources agree that this is where the legend began (or perhaps this mysterious book is a legend itself?). The legend grew from the popularity of the book, and people just assumed that the locations were real. Map of the Goshiki Fudo from this site. 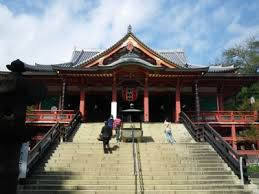 Just as every year tourists flood London seeking 221B Baker Street in a quest for Sherlock Holmes’s apartment, and Platform 2 ¾ to catch the train to Hogwarts, during the Meiji period people heard of these magical five temples and went in search of them. As we will see below, the Black Eye and White Eye temples were easy enough to find, but the other ones were a little bit harder—due to the fact that they didn’t exist. With all those tourist dollars up for grabs, it didn’t take long for entrepreneurs to turn these fictional locations into reality. Enterprising priests were quick to take advantage of the legend-seekers and started to declare themselves the home of the missing three Fudo. They painted the eyes of their statues to match the legends and try to draw in the crowds. The end result is that you get multiple locations, all vying for authenticity. Finally, these settled into the six temples known today, with at least two temples claiming to be the authentic “Yellow Eye.” In reality, with the exception of the Black and White Eyes, all of the statues can be traced to around the 1880s. 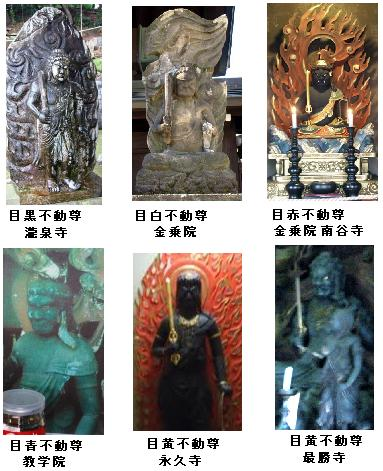 Image of the six Fudo statues from this site. At least two Goshiki Fudo locations appear to be genuine: Ryosen-ji and Konjyo-in, known also as Meguro (目黒; black eye) and Mejiro (目白; white eye). The temple Ryosen-ji dates back to the 9th century, and has an ancient black-eyed statue of Fudo known by the name Meguro Fudo (Black-eyed Fudo). This is the only authentic Fudo statue in the set. 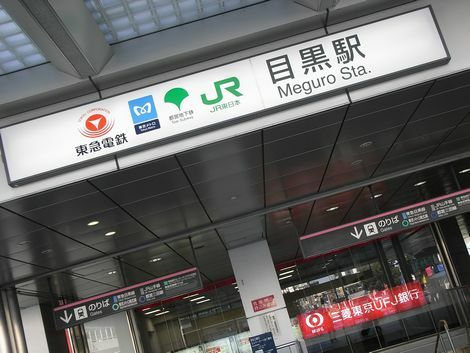 The Yamanote line train stop for this area of Tokyo is also called Meguro, and is a name most Tokyoites are familiar with. Another train stop down the line is called Mejiro. While this is read as White Eye (目白), the area is named after a type of bird—the zosterops japonicus AKA Japanese White-Eye—and not a Fudo statue. However there is a nearby temple, Konjyo-in, that dates back to the 16th century. Like many temples, Konjyo-in has a Fudo statue. Over the years, people noticed the Black Eye/White Eye dichotomy and their imagination made a connection. During the Edo period, there was some vague mention of the “Three Fudos,” of which the Black- and White-Eye Fudos may be connected. The Meaka (Red Eye) is usually considered as the third candidate for the triumvirate, but there are several thousand Fudo statues in temples around Tokyo and nobody really knows for sure. 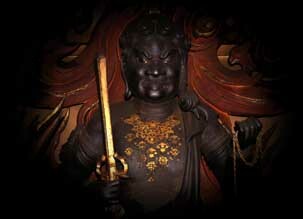 There is also mentions of statues of the Four Deva Kings (known as the Shitennō in Japanese) positioned to protect Edo. Along with the mystery story, these have probably morphed into the modern Goshiki Fudo legend. Meaka (目赤；Red Eye) – Nankoku-ji (South Valley Temple) – Dating from 1616. – Claims to be associated with Red-Eyed Fudo from 1788. 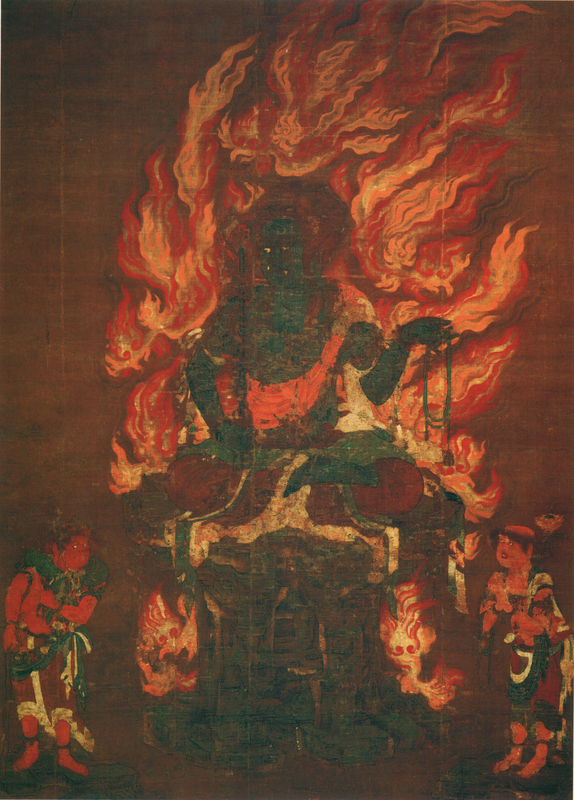 Fudo statue and temple burned in WWII. Reconstructed in 1985. Relocated in 2011, with old temple grounds turned into a parking lot. Meao (目青；Blue Eye) – Saisho-ji (Great Victory Temple) – Dating from 1882, built over the top of a previously ruined temple. Blue-Eyed Fudo statue installed as part of construction. Meki (目黄；Yellow Eye) – Eikyu-ji (Eternity Temple) – Dating from 1880, Constructed with Yellow-Eyed Fudo installed as part of construction. The book Kanto no Fudosan to Shinko identifies this as the true Meki. Meki (目黄；Yellow Eye) – Saisho-ji (Great Victory Temple) – Same name as Meao, but unrelated. Dating to 860. Moved to Hirai ward in 1912. Exact date of association with Goshiki Fudo unknown. There are still others that claim to be authentic. Ryugan-ji, for example, claimed to be the real Meki in 1930, but no one is really buying it and it rarely makes it on the tourist maps. There are others as well, but none of note. Real or not, many still believe in the power of the Goshiki Fudo. Like other mythical locations of dubious heritage, the legend has become the fact—enough to where some in Tokyo actually worry about disrupting the magical circle. Most notably in the case of the SkyTree Building. Built in 2010 and completed in 2012, the building’s official name is Tokyo SkyTree, which was chosen as part of a naming contest. When the 2011 earthquake and tsunami devastated Japan, people went looking for answers and some laid the blame (perhaps egged on by the slightly mad governor of Tokyo, Ishihara Shintaro) on SkyTree breaking the power of the Goshiki Fudo. According to legend, the Goshiki Fudo was established to protect Edo against the north. In geomancy, the northern direction is called the Gimon or Demon Gate and is considered unlucky. 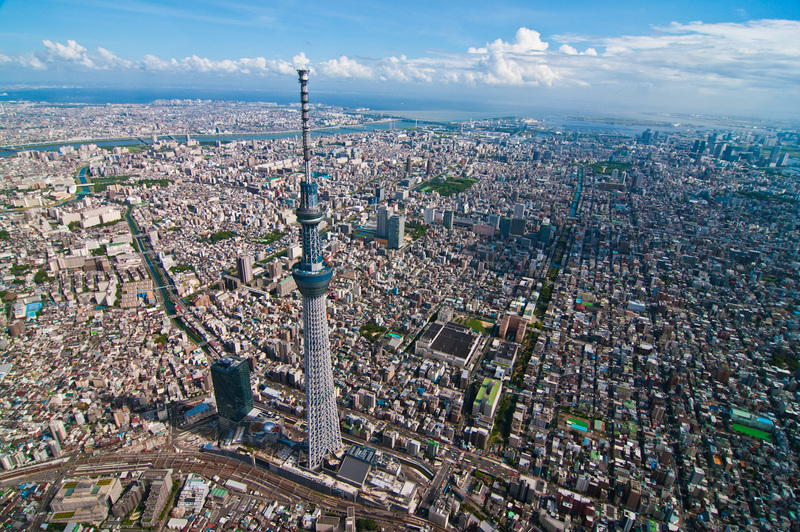 Tokyo SkyTree was built in the North, which was rare for sizable Japanese buildings. Some Feng Shui practitioners say its shape resembles a Poison Needle, drawing the unlucky power of the North down into the soil of Tokyo. Some modern spiritualists further say that the Tokyo SkyTree building is constructed over a Ley Line, disrupting its flow of power into Tokyo. To the contrary, the building’s designers claim the Tokyo SkyTree is a Gorin-to—a 5-Story Pagoda—and thus adds extra protection against the unlucky northern direction. Neither advocates nor distractors can quite explain how the Goshiki Fudo failed to protect against neither the 1923 Great Kano Earthquake nor the WWII firebombing of Tokyo long before the building of the disruptive SkyTree. This started out as a simple research question for Wayward , but ended up in a deep exploration of the true nature of the Goshiki Fudo. It was a trail that lead to a somewhat disappointing end, mainly because I prefer to believe in the magical and mystical. However, the tourist trap nature of the Goshiki Fudo was inescapable. But then I wondered if that even mattered. After all, it is often the belief that creates the reality, not the reality that creates the belief. The fact that it was originally devised as a tourist trap doesn’t stop people from believing in its power. The symbolism and story is more important than history. Thousands visit the Temple of the Golden Pavilion in Kyoto every year, even though it was only built in 1955 and finished in 1987. They pay homage to the graves of the 47 Ronin, even though that is a tourist trap as well. The sites serve more as a focus of belief and cultural heritage–a way to reinforce what it means to be “Japanese”—than as some record of history. It is no different from Christians going on pilgrimages to see holy icons. They aren’t “real.” Any amount of research reveals that they were tourist traps, from the Shroud of Turin to pieces of the True Cross. But that doesn’t affect the honest emotions they summon up for believers. Or for that matter American pilgrims going to see the Liberty Bell. The fact that it could not possibly have been rung on July 4th, 1776 (as the legend goes) does not mean that the story isn’t good, or prevent it from being a powerful symbol of the country. Every country has similar venerated forgeries. The Wallace Sword on display in Scotland mostly likely did not actually belong to William Wallace. And when I was in London, I went to 221 Baker Street to see the home of Sherlock Holmes. I knew it was pure fiction, but that didn’t dampen the feeling that I was standing in the home of the Great Detective.